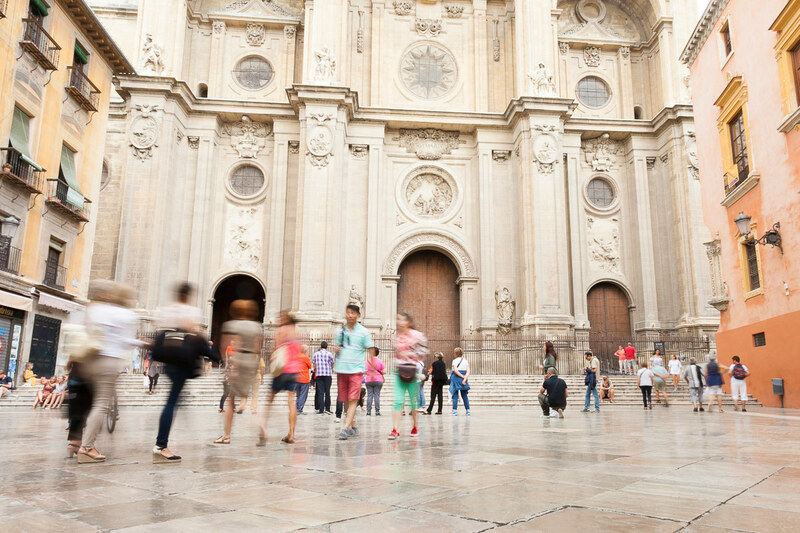 With 270.000 inhabitants Granada is the capital of the province of the same name and is the home of one of the greatest universities in Spain, founded by Charles V in 1526. More than 60.000 students make an exciting contribution to the city, especially to its nightlife. Cafes, pubs, bars, restaurants, terraces and a huge variety of free tapas can be found in every street. 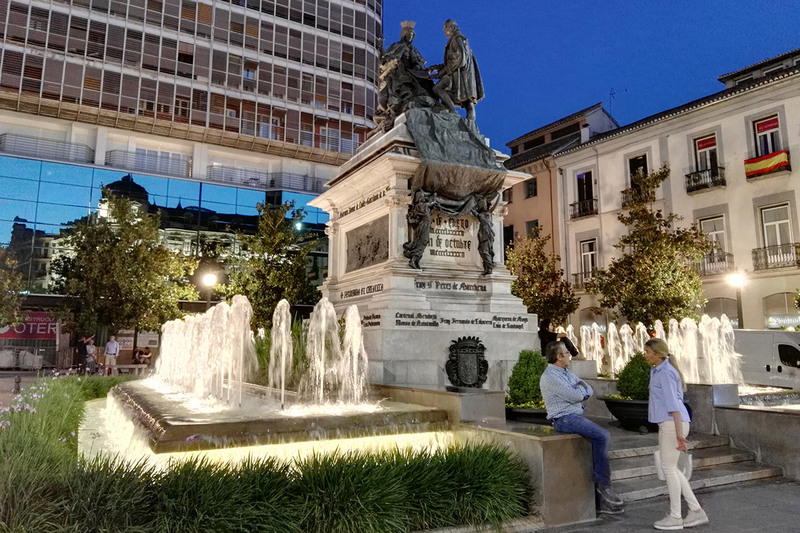 Some of Granada's many cultural activities include the International Theatre Festival, Tango Festival, International Jazz Festival, the Manuel de Falla Auditorium's annual programme, Flamenco Festivals and the International Music and Dance Festival. The most famous celebrations are: Easter Week, The Day of the Cross (May), Granada Fair (June) and the Zaidín Festival. See Celebrations in Granada for a full list of celebrations. Plaza Nueva is located close to numerous specialist Arab shops. 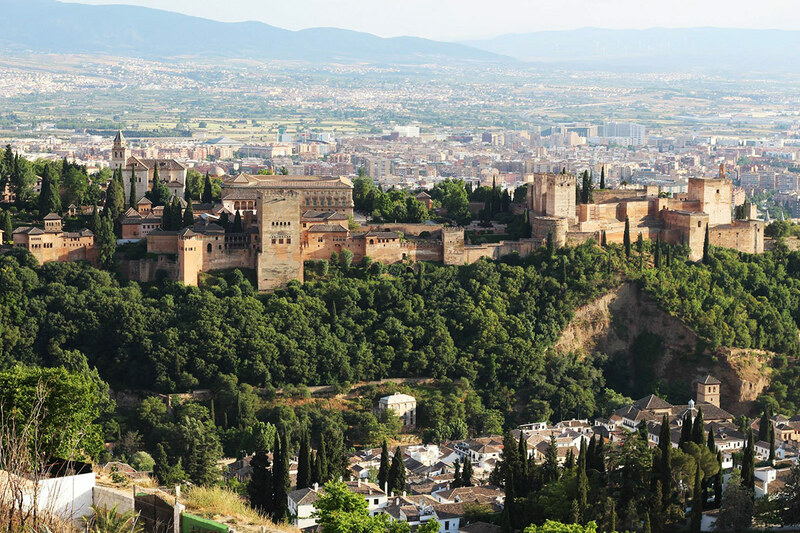 Granada has played an important role in the most spectacular chapters of Spanish history. Arab dominance in the city dramatically influenced its culture and created one of the world´s most precious and unique monuments: the Alhambra and Generalife. The Renaissance left its mark with the Cathedral, the Capilla Real, (where the Catholic King and Queen are buried), La Cartuja, the Monasterio de San Jerónimo and numerous churches and palaces. The Albayzin, the oldest quarter of Granada, stretches over the hill opposite the Alhambra. 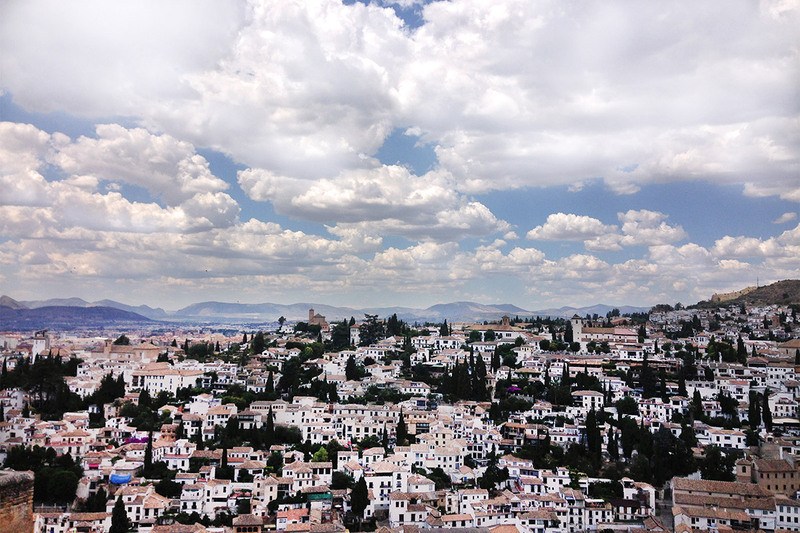 Narrow, cobbled streets rise and fall leading to small squares, caves or beautiful viewpoints of the Alhambra, white houses with patios or gardens, fountains, and Arab houses with a Mediterranean flavour. 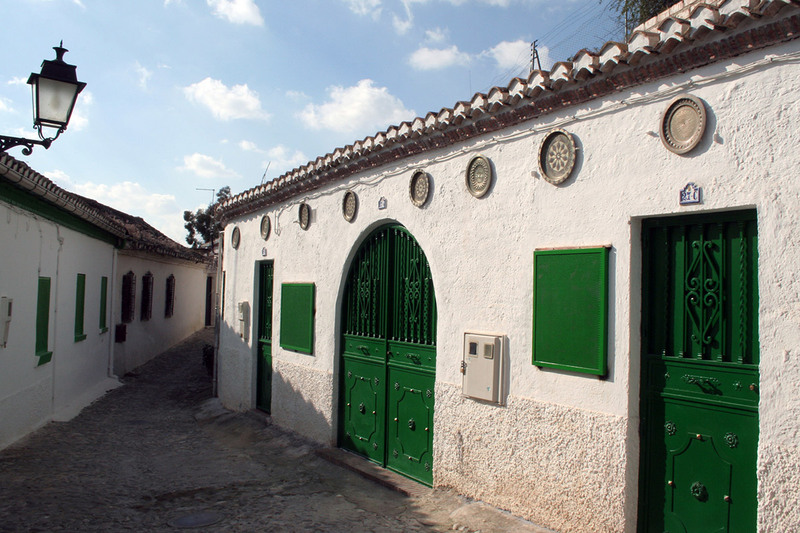 Visit the heart of Flamenco in the caves of Sacromonte where the Gypsies live; the Jewish quarter; the Realejo and the Alcaicería, an Arab bazaar with Moorish arches and marble columns. 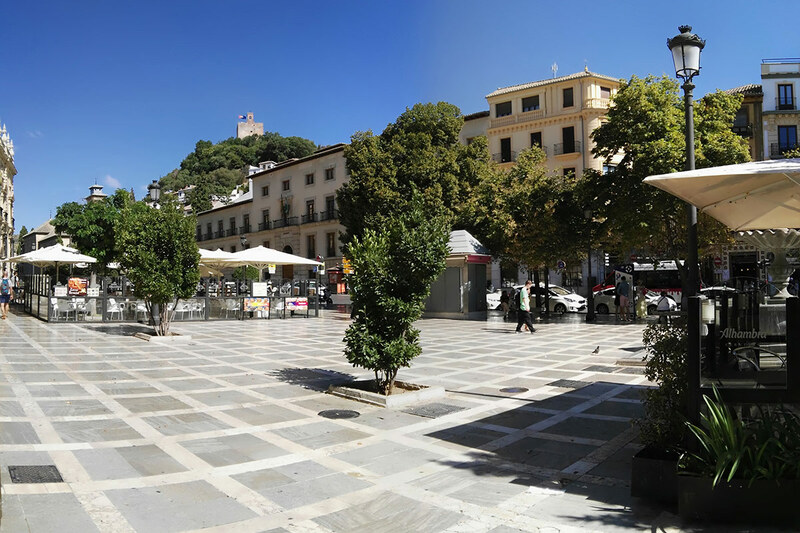 Enjoy the busy Plaza Nueva and the terraces of El Paseo de los Tristes, situated at the foot of the Alhambra hill. Granada has an ideal geographical location. 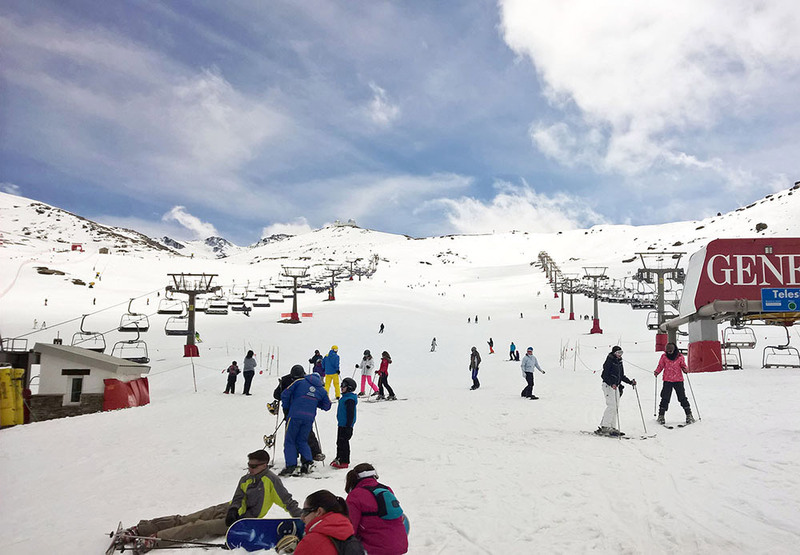 You can contemplate the snow-covered summits of the Sierra Nevada (the ski resort of Pradollano - November until April - is just 33 km. from Granada) or the rich, green countryside of the Vega. You can stroll along the footpaths of the Alpujarras, see the cave-houses of Guadix, pay a visit to Sevilla or Málaga, or enjoy The Costa Tropical. Language school in the centre of town. Escuela Delengua is situated in the heart ofGranada, very close to the Cathedral, beside Plaza Nueva, at the foot of the Albayzín. Here is a list of the average prices in Granada. It should help you plan your budget while you study Spanish in Granada. Please bear in mind that these are just a guide and that prices do fluctuate throughout the city. People from Granada celebrate the capture of the city by the Catholic Kings. The youngest councillor holds the standard of Castile and greets the people from the balcony of the Consistorio. A civic procession also takes place in the city, during which the standard of the Catholic Kings is shown along with the coat of arms of Granada. The celebration has been going on since the death of Ferdinand the Catholic King. Without any doubt this is one of Granada´s most traditional celebrations. On the night of the 5th, there is a big procession through the city and The Three Wise Men on horseback give out sweets to the children of Granada. Children receive presents from 'The Three Kings' on this night and it is celebrated more than Christmas. People celebrate the arrival of the 3 Kings to the Nativity, children enjoy playing with the presents that they received the night before and this day is a national holiday. San Cecilio is the local patron saint of Granada and the day is celebrated with processions, dancing and other festivities. The yearly carnival is celebrated all over Spain with events like parades, mask and costume parties. A state holiday throughout Andalusia to remember that in 1980 people occupied the streets of the city to claim political autonomy and freedom. Easter is one of the most important religious events in Granada, and Spain. It is celebrated with impressive religious processions where statues of Jesus and The Virgin Mary are carried around the town, with music and people dressed in special costumes. 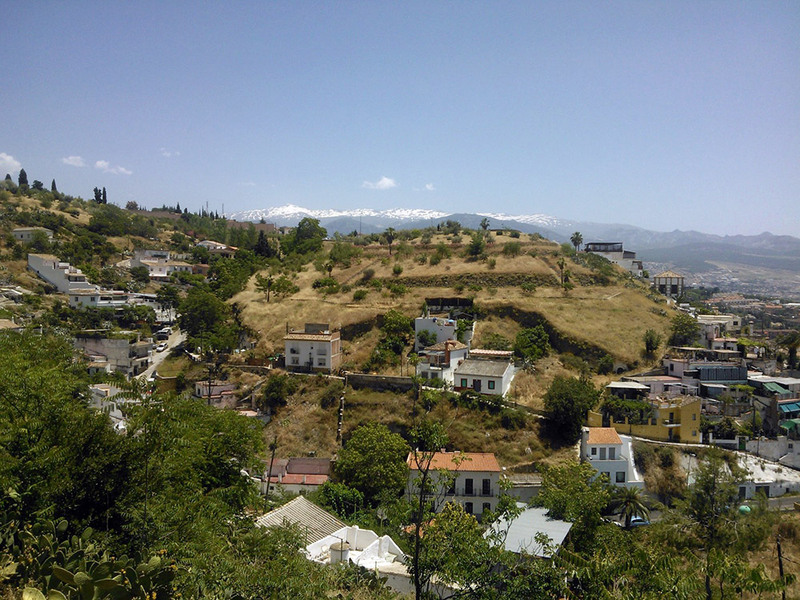 One of the most important processions is that of the gypsies of Sacromonte. On the 1st of May 1886 the Labour Union of Chicago organized a strike to establish an 8 hour working day. This day is celebrated in Granada with competitions: for example, who can decorate the most beautiful cross. It is a local holiday. Granada lights up during this celebration, wine, tapas and Sevillanas dancing are the real stars of the party. Mariana Pineda was a revolutionary from Granada who was sentenced to death by King Fernando VII. The day is celebrated on the Mariana Pineda central square but is not a holiday. Corpus Christi as a religious festival is celebrated with church services and processions. In Granada, a Summer Fair takes place over the week of Corpus Christi, when popular entertainments tend to eclipse those of the church. "Casetas" or marquees are set up in the historic centre of the city where there is music, food and drink available, especially at night. There are religious processions on Corpus Christi Day, but the majority of the action takes place in fairgrounds near the edge of the city. The 28th of June: San Pedro, in the Albaicín. The romeros go up to the Ermita de San Miguel riding horses or travelling in decorated carts. This event is celebrated with artists from all over Europe. It is a superb event that takes place in a variety of amazing locations, such as the Alhambra and the open-air theatre in the Generalife gardens. People celebrate the assumption of Mary into Heaven. They celebrate with processions and by donating flowers to the virgin. This is the Patron Saint of Granada and the people of Granada offer flowers to the Virgin. The central event is the procession of the Virgin, which is accompanied by a traditional market where autumn fruits and olive oil biscuits are sold. This fiesta is celebrated during the whole weekend with music and dance concerts, fireworks and a football tournament. The 12th of October: National Spain Day. A date that commemorates the discovery of America by Cristobal Colón (Christopher Columbus) in 1492, which became the National Day of Spain. The Church wanted to remind people that there are many important Saints whose names or feast days do not appear in the calendar. This day is to remember all those Saints. People celebrate the rectification of the Constitution. People celebrate the Virgin and the Immaculate Conception. People celebrate the birth of Jesus. At midnight Spanish people gather in the Town Hall square to eat twelve grapes precisely at the stroke of midnight one after another. The party goes on all night long.